Just Create: Writer Placing Ads for Comic Book Artists - What Works? 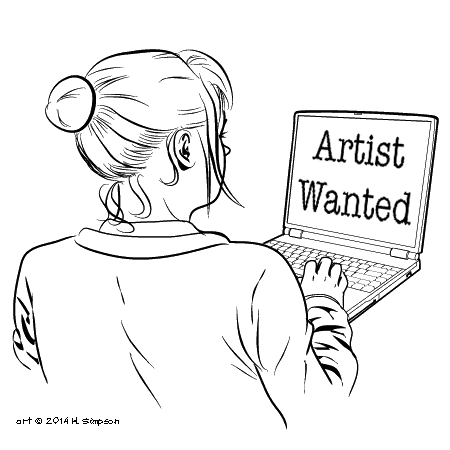 Direct the artist to your online writing portfolio. Put pages of past comics you’ve done along with the script. Editorials and reviews you’ve written don’t count. Write how much you are offering for the pages to be done. Don’t ask what the artist’s page rate is unless you have an unlimited budget. It just wastes time for the artist to tell you the rate and then you respond with, “Well, I don’t have that much to spend.” or “Can you do for this lower rate I can afford?” A bad ad asks the artist to give them a reasonable rate. However, this means reasonable for the person placing the ad and is code for. “Give me a cheap rate, not your normal rate.” A reasonable rate is adequate payment for the artist, not a cheap rate. You know your budget, so just say what you can afford. If you have no money to give, then offer a full collaboration with the two of you crafting a story together. A nice way to bond as co-creators. Both of you will share the copyright and trademark in the project. Explain you story idea. Provide a synopsis, not a full script. Maybe two or three different ideas for an artist to pick which they have an affinity towards drawing. It’s best to start small, with a 5 or 8 page story for an anthology or contest. It helps to build your reputation, portfolio and you learn how to work with an artist while having less of a time commitment. A history of paying your artists separates you from writers who don't offer pay. How much you are able to pay will determine the quality and dedication of the artist you get. State the deadline. If you are not going to pay the requested page rate, very low rate or not at all; then you have to be flexible with the deadline. Don’t offer credit like it’s payment. Credit should be given anyway. Don’t say it’ll make a great portfolio piece. That’s for the artist to decide. An artist doesn’t need your story to create a sequential portfolio. Don’t ask for sample art, if you are not going to pay for it. Agree on payment terms for the job. A deposit to begin, progressive payments, upon delivery, how many days after delivery, using Paypal, check, etc. Specify the type of file you want for delivery. As an option, rather than placing an ad, email an artist directly. It can’t hurt. Some advice from writer Brandon Easton about hiring an artist. Does anyone have anything to add to composing a good ad to get an artist? previous - Where do I find an artist?